Following a successful run of stories with Melanie Bush beside the Sixth Doctor, Big Finish returns to the rather more crowded TARDIS crew comprised of the Fifth Doctor, Nyssa, Turlough, and Tegan. Yet while Big Finish is certainly not afraid of tackling enemies and storylines from the classic televised series, the reintroduction of Eldrad from ‘The Hand of Fear’ was certainly not a concept topping many fans’ wish lists. Still, Marc Platt revives the titular Kastrian for ‘Eldrad Must Die!,’ a fitting homage to the original that further defines the foe while presenting a new type of peril for the Doctor and his companions. Rather than retread the footsteps of the original tale directly, here a collection of silicone crystals rapidly spreads across a quiet seaside village, transforming wildlife and humans alike into servants of one of two Kastrians, Eldrad or Mulkris. Although the medium doesn’t allow for the visualization of the crystals subsuming other beings and thus relies on somewhat stilted dialogue to convey the sights and actions, the imagery employed to realize the transformations at hand is nonetheless superb. However, as Mulkris’s search for Eldrad’s eye continues rather inefficiently, the repetitious antithesis of ‘Eldrad must die’ in ‘Eldrad must live’ quickly turns this production into a somewhat less effective and more meandering affair. 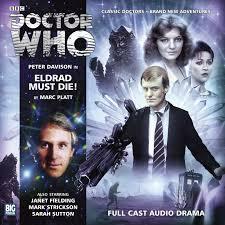 Having Gibbs, a friend of Turlough’s from Brendon Public School, be the one to initially enter the nuclear reactor and proclaim ‘Eldrad must die’ is a nice nod to continuity and does help bring Turlough more emotionally into the mix while offering some nice characterization that highlights the fear of failure being his main motivational force. Even after a somewhat slow start, the second half does markedly pick up the momentum and lead to a genuinely exciting climax- though one reminiscent of that of ‘The Hand of Fear’- on Kastria itself. Gibbs is, of course, ill-fated in his attempts to embody the power of Eldrad, but the consciousness of the Kastrians is used to good effect throughout the story, showcasing that these aliens can certainly present a unique and daunting challenge. The ending does seem to hint that Eldrad may still be around to wreak havoc once more in a future story, though, but it’s hard to imagine what more could be mined from the character that has been thoroughly explored twice. Although Turlough does get some meaningful work both while possessed and not, Nyssa and Tegan are very much relegated to the sidelines for this story. Still, all three companions do share a strong chemistry that is very apparent when together, and Peter Davison gives his usual dominant performance as always. Stephen Thorne is exceptional with his reprisal of Eldrad even if his time is essentially limited to the final episode, and the direction and sound design bring the seaside and alien landscapes to life wonderfully in this well-paced tale. ‘The Hand of Fear’ was not screaming out for a sequel and seemed to be a rather self-contained story, but Big Finish has managed to revisit the premise of that episode while putting a new spin on the classic events surprisingly successfully. Although ‘Eldrad Must Die!’ is unlikely to go down as a classic, it nonetheless tells an intriguing tale that highlights the versatility and standards of production quality that Big Finish Doctor Who has come to represent.